Meeting Harry Lomas MBE during my recent stint as a food judge was definitely one of the highlights of my chef career so far. Harry has been in the industry for over 40 years, he directed food services for the British Army, the 2012 Olympics and has worked in the Royal Household and yet he still has the most incredible passion and drive to achieve excellence and to pass his knowledge and passion on to the next generation of chefs. When Harry asked me if I would like to come along to The Grove, where he is Executive Head Chef, to run a masterclass about traditional Indian spices and cooking, I was only too happy to do so. The Grove is a luxury hotel, golf and spa resort set in 300 acres of rolling Hertfordshire countryside in Chandlers Cross and only 18 miles from central London, the former home of the Earls of Clarendon and is dubbed London’s Country Estate. The fact that it is luxurious and run by impeccably courteous and groomed staff goes almost without saying. However it was the food and drink operation that Harry runs that I was interested in. There are 3 restaurants at The Grove, Colette’s is the fine-dining restaurant, and the Head Chef is Russell Bateman, who you may have seen representing the South-East in this year’s Great British Menu. I also recognised the sous-chef Scott Barnard when I popped in to say hi, who was a finalist in 2015’s MasterChef: The Professionals. The Grove is set to get even more TV coverage soon as head pastry chef Reece Collier is leading a team in the next series of Crème de la Crème. The Grove also has a gastro-pub the Stables, and the Glasshouse restaurant both of which run by Andrew Parkinson (previously head chef at Jamie Oliver’s Fifteen and Brasserie Zédel). So a really stellar line-up in the kitchens at The Grove! The scale of the operation is genuinely staggering. The hotel has 217 rooms, and lots of large events space meaning it is popular for weddings and corporate conferences. The hotel has around 10,000 plates and 5000 teacups. The kitchens get through 500 eggs and four 55kg sacks of potatoes every day! And we are talking 365 days of the year. They have fresh deliveries every single day of the week. I asked Harry what happened if he was let down by suppliers. “That wouldn’t happen”, he says, steely-eyed. I think the suppliers would know better than to mess Harry about! Harry is also very particular about provenance of his ingredients; all the fish is from sustainable sources and the beef is Aberdeen Angus or Charolais supplied by the Queen’s butcher Donald Russell. 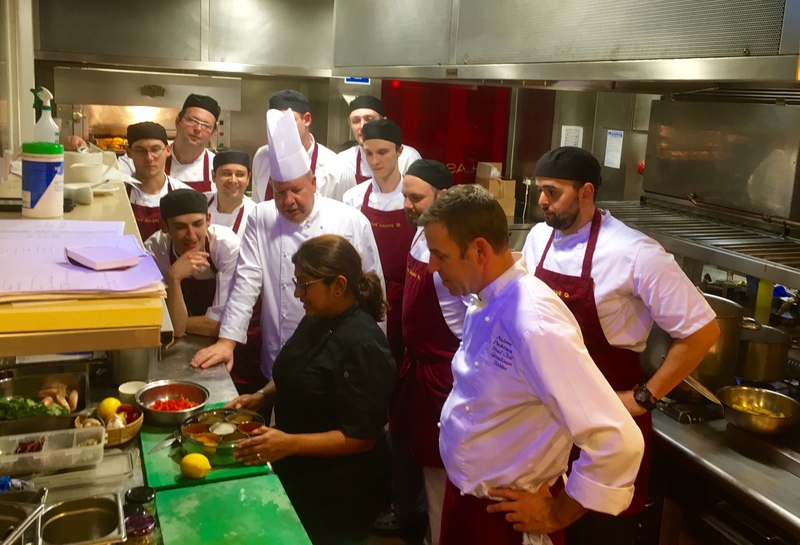 My masterclass was with around 12 chefs in the 170 cover Glasshouse restaurant, demonstrating a lightly spiced sea bass, with new potatoes in pickling spices and a chilli sauce vierge, followed by a chicken bhuna curry and a cauliflower and cabbage bhaji. I was slightly nervy to have all these experienced chefs hanging on my every word as I explained to them that sometimes less is more, and a hint of spice can be just enough to enhance the flavour of an ingredient without masking it. They were also impressed (I like to think!) by the freshness and clean-ness of the flavours, which is how traditional Indian food should be. I left them with lots of notes and ideas for new dishes. Given that the Glasshouse boasts 190 different items on the buffet every day, I think some of my recipes may feature one day. There is so much I could write about our amazing stay at the Grove. The friendliness and professionalism of the staff was impeccable, the food we had at Colette’s was magnificent and the sheer variety and quality of the food available throughout the operation was remarkable. But the Grove is more than a good place to eat and drink, it is an academy for the next generation. On our arrival we were greeted and checked-in by Chris, whom Harry had spotted when he was with his family in the restaurant celebrating his 18th birthday. Spotting something good in the young man, Harry encouraged him to get in touch, and he is now working there under an apprenticeship scheme. Just one more in a long line of Harry’s protégés. Harry’s ethos is to train the next generation of chefs, which is why he wanted me to go there in the first place. Otherwise, he says, there won’t be a next generation. Unless the chefs of the old school continue to preach the basics of cooking from first principles, i.e. from raw ingredients, the art will soon die away. Harry is also passionate about competition cooking as he says it keeps chefs on top of their game, always learning about new products and new dishes. He also believes it is great for young chefs to have to talk and represent themselves on stand in front of judges, it develops character, self discipline and confidence. It certainly seems to work, the chefs I met were engaged, bright and curious to know more. I was so pleased to add my little bit of knowledge into the pool to be taken forward. For a truly memorable experience I wouldn’t hesitate to recommend a stay at the Grove. And if you see a Lancashire gent in a pristine white chef’s jacket and toque, don’t forget to say hi to Harry.